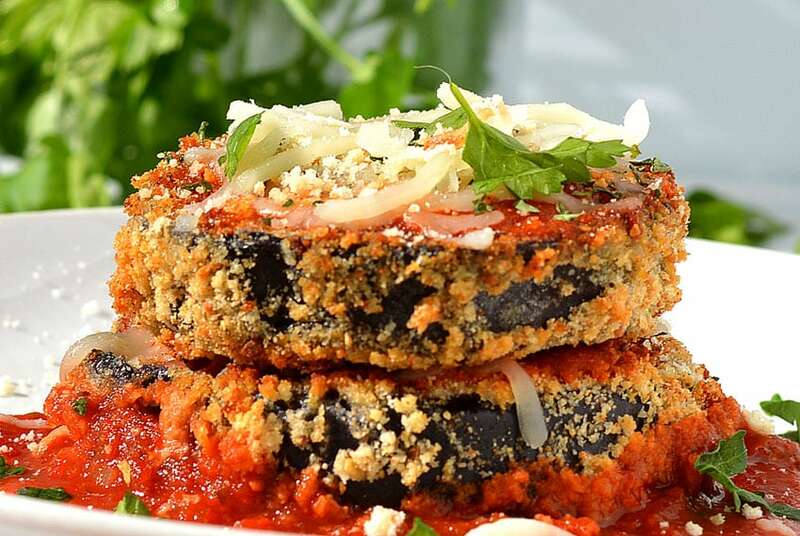 This Baked Eggplant Parmesan is so easy and offers a nice alternative to frying. The process remains the same, but instead of frying, we lightly oiled a preheated sheet pan and baked the coated eggplant. As a time-saver, the sauce begins with our favorite jar of basic marinara to which I add seasonings and fresh herbs. I get a lot of questions regarding the vegan cheeses I use. I link to them only so that you can locate the brands, I am not sponsored by them in any way – I just like for you to be able find them! One brand I really happen to love is GO Veggie! They offer both a great parmesan grated topping product and a shredded mozzarella. You’ll want to start by slicing the eggplant into 1/2″ slices. I do them thicker than most as I serve this as a stand alone dish. It’s the star of the show here! In a large colander, place the slices and the salt. Toss well. Allow them to sit over a bowl or in the sink until it produces anywhere from 1-3 Tbl of liquid. This takes about 35-40 minutes. Prepare the flax wash mixture and allow to become gelatinous. If it gets too thick, just add more water. Remove and place on paper towels, pressing to extract as much liquid as possible. You can also wipe away the excess salt if you desire. Preheat the oven AND the baking sheets. Create a breading station. In a large dish or pie plate, place the flax mixture. In a large zip-top bag, add the flour and toss the eggplant. Shake to remove the excess flour. 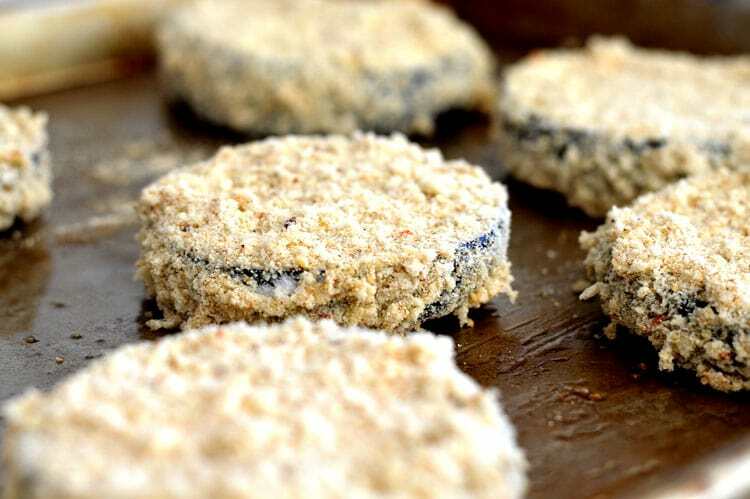 Coat the floured eggplant with the flax wash mixture and then immediately into the panko mixture. Remove the preheated sheet pans and lightly brush with oil adding the breaded eggplant directly to the oiled areas. After 10 minutes, flip so both sides brown and crisp evenly. Bake until golden. 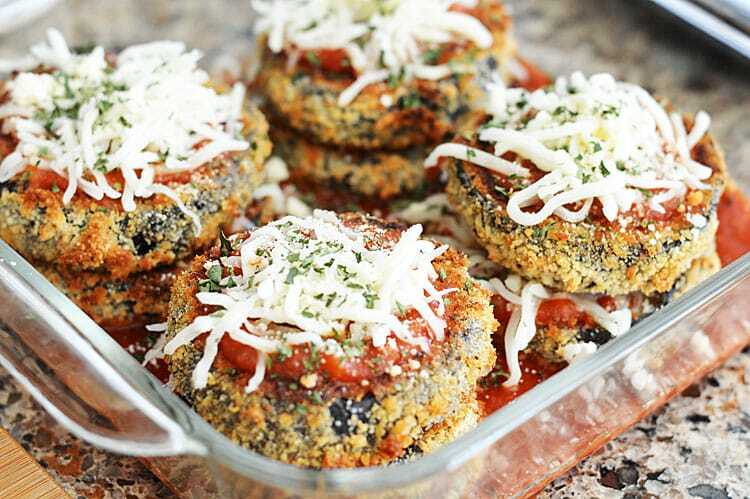 In an 8″x8″ baking pan, add 4 of the breaded eggplant. Top with sauce, parmesan and mozzarella. Add another eggplant layer and repeat with sauce, parmesan and mozzarella. I also add a little parsley at this point. Bake until golden and bubbly. In a large colander, add the sliced eggplant and the salt. Place the collander in the sink or over a bowl to collect any of the extracted moisture. You may get anywhere from 1-3 Tbl of water depending on the eggplant. This takes about 35-40 minutes. You can wipe away any excess salt before proceeding as you press them to remove any remaining moisture. You want to remove as mush liquid as possible. In a bowl, add the ground flax and water. Allow to sit and thicken (preferably in the refrigerator) for about 10-15 minutes. You want it gelatinous, but if it gets too thick, you can always thin with a bit more water. This will be our "egg" wash mixture. Preheat the oven to 400 degrees and place your baking sheets in NOW to preheat. Combine the bread crumbs with the parmesan and seasonings in a large dish or pie plate. In another bowl, or zip-top bag, add the flour and toss the eggplant, shaking to remove any excess. Take the flour-coated eggplant and dip in the wash mixture until completely coated. Follow with the breadcrumb mixture. 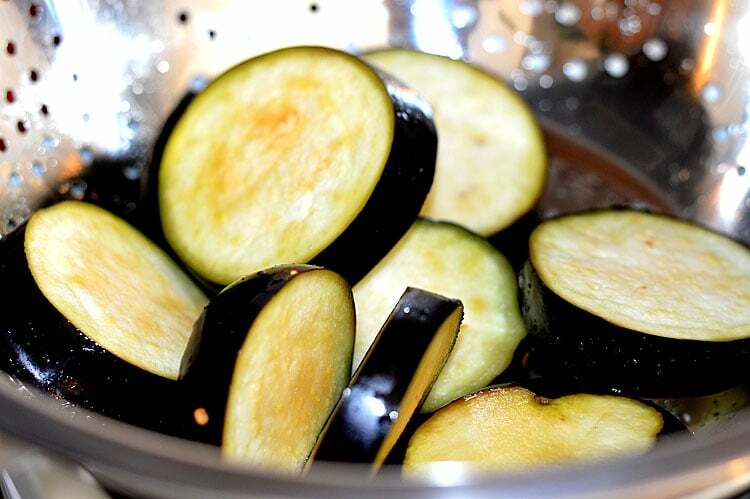 Remove the preheated baking sheets and before placing the eggplant, brush with oil. Bake for 10-15 minutes and then flip until both sides are crispy and golden brown. In a saute pan, add the oil and onions. As they begin to soften, add the garlic. Add the onion mixture and spices to the sauce. I like to heat mine so that it's already hot before going into the oven. Add some sauce to the bottom of an 8"x8" baking pan, and place four of the baked eggplant slices. Top with a bit of sauce, followed by parmesan and mozzarella. Add to that, another slice of the eggplant on top of each. Repeat with sauce, parmesan and mozzarella. Bake at 400 degrees until hot and bubbly and the cheese starts to melt. Garnish with fresh parsley or basil. I haven’t tried their parmesan topping but it looks like the real deal. Is the taste artificial? I have such a hard time getting into faux cheeses because the texture is usually gummy or the taste is funny. This looks delicious. 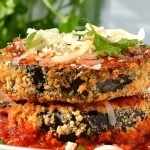 I love baked eggplant and dredged in thick tomato sauce sounds perfect! This looks really good! I’ve never tried the GoVeggie mozzarella, but I have had the parmesan and it is amazing! Go Veggi cheese is amazing and the only type off alternative cheese I will eat! This recipe looks delicious, but I just wanted to point something out about Go Veggie products. They are unfortunately not all vegan. The Go Veggie Mozzarella Shreds contain casein which is milk protein. However, the Go Veggie Parmesan Style topping is vegan and had the vegan sign on the back. I wish they would be more forthright in their marketing as not everything is vegan and I was buying the entire product line for my family until I examined the ingredients! I love your website and look forward to more delicious recipes! !